The Church across the country is preparing to let its hair down with a week-long party to celebrate Pentecost – the Birthday of the Church – kicking off with four huge launch events in key locations across the country! Plans are well advanced for The Biggest Birthday Party Ever launch events in Sheffield, Birmingham, London and Merseyside across the weekend 29 May until 1 June featuring music and dance ahead of a week of hundreds of community-based celebrations as churches run their own local parties*. 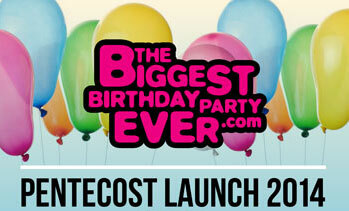 For a taste of what’s in store, The Biggest Birthday Party Ever launch video can be viewed here. “It’s time for the church to exit their buildings and share this momentous occasion – the Birthday of the Christian church – with their communities. It’s an exciting time for all of us and we plan to party in style, not just for fun but to share our love of Jesus with those around us and to show the joy which God can bring into our lives and the difference he can make to us and our communities,” says Andy Frost**, Director of Share Jesus International, the organisation behind Pentecost Festival and The Biggest Birthday Party Ever. Andy will be one of the speakers at the four Launch Parties, but also on the bill are the musicians/artists Ben Cantelon and Luke Hellebronth plus the Worship Central band, who have just issued a new ‘live’ album. Singer/songwriter Philippa Hanna, who has just completed a tour with the X-Factor’s Rebecca Ferguson, will also be on stage, and the Rebirth Dance Network is creating a special performance and dance piece to represent the Pentecost theme. Local acts will also take part in the different cities where the launch parties will be held. Entry: £5 including booking fee / Group bookings of 10 £45 including booking fee. * Tom Read will replace Worship Central’s Ben Cantelon and Luke Hellebronth. The Launch Parties will be a great opportunity for groups/churches to have a fun night ahead of a busy Pentecost week. For more information about the launch events, entry or venues and to register/buy tickets go to www.sharejesusinternational.com/launch or call 020 8944 5678. The Biggest Birthday Party Ever will also be launching some social media campaigns in the run-up to Pentecost so follow on Twitter @TBBPE and join the Facebook group.